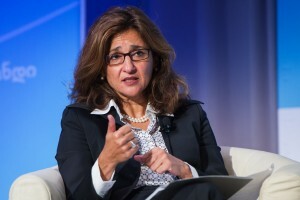 Shafik was speaking about the Fair and Effective Markets Review to an audience at the London School of Economics on October 26. She is leading the review, which looks at fixed income, currency and commodity markets, alongside Martin Wheatley, chief executive of the Financial Conduct Authority, and Charles Roxburgh, head of financial services at HM Treasury. You can read the full text of the speech here and other documentation on the Fair and Effective Markets Review, including the consultation paper, here. I was born in Egypt but left at a very young age when my family lost everything as a result of nationalisations under the Nasser government. It was a time when many well-intentioned people thought that the state could do a better job of allocating resources and managing economic activity than the market. That view was proven wrong. Perhaps as a result of that experience, I have spent large parts of my professional life thinking about the relationship between the state and the market. The perspective I have reached is that well-functioning markets are the key to prosperity, but that they must operate in ways that are fair and effective to sustain public support and confidence. By “fair and effective” I mean markets should allow their ultimate end users to invest, fund themselves, and transfer risk in a resilient and predictable way, on the basis of competitive prices. They should offer appropriately open access and transparency. And they should operate according to clear standards of market practice and integrity. The shadow of the worst financial crisis in living memory has been significantly lengthened by a series of appalling cases of misconduct in Fixed Income, Currency, Commodity and other markets. Details of these began to emerge relatively late in the crisis, but they have proved surprisingly prevalent and persistent. And they have further eroded the trust of the general public in financial markets. Public outrage is based on the view that the rewards in finance are disproportionate and that the system is rigged. When people read of malpractice in financial markets, of trading profits being claimed through manipulation, collusion or dishonesty, they naturally wonder if they are one of the people who have been wronged. As somebody who believes in markets, I find this behaviour outrageous. Some academics I have spoken to think that part of the answer may lie in the field of moral psychology. The initial transgression may be small, but the culmination of many small transgressions can result in a set of behaviours which would normally be unacceptable becoming the norm, and an undesirable culture becoming ingrained. This is a version of the old proverb that one bad apple spoils the whole barrel. But the initial argument that it is just the case of “a few bad apples” is no longer credible. Instead it seems that there were deep rooted problems in the nature of FICC markets that resulted in practices that would be unacceptable elsewhere. First and foremost, the FICC markets are notable for their heterogeneity. That reflects a key role of many FICC markets in providing bespoke instruments, tailored to meet the needs of investors and issuers. The downside of the heterogeneity of many FICC assets is that the market in specific instruments can sometimes be thin, and hence it may be difficult to gauge what a fair price is. Publicly available quotes can be based on a limited number of small transactions, making them more vulnerable to manipulation. In legal terms, caveat emptor expresses the basic principle that a buyer of property purchases it at his or her own risk, and that — unless expressly agreed otherwise with the seller — there is no guarantee that the value of that property will not fall. In such circumstances, market participants should invest time and energy in looking after their own interests, voting with their feet when they are poorly treated. Such market discipline has historically always been thought of as a key bulwark against widespread abuse in FICC markets. The structure of these markets is already changing. It isn’t just the UK: the most high profile enforcement cases to date, involving the manipulation of short-term interest rate benchmarks, have affected every major financial centre, including London, Singapore, Frankfurt and Tokyo, and have already resulted in global fines totalling nearly £4bn, by authorities in the United States, the United Kingdom and Europe. Good progress has also been made on the design and regulation of benchmarks. Libor has been overhauled. The International Organisation of Securities Commissions (IOSCO) has introduced a new set of standards for benchmarks, and the Financial Stability Board (FSB) has produced detailed reports on the priorities for further reform of interest rate and foreign exchange benchmarks. A number of broader regulatory, market and firm level initiatives are also under way in this area: the second Markets in Financial Instruments Directive (MiFID 2, the European Market Abuse Regulation (MAR), the programme of derivatives reform led by the G20, and foreign exchange committees have committed to developing a set of global high-level principles on FX trading. There have also been a number of initiatives aimed at improving culture and behaviour at a firm and individual level, including the UK Parliamentary Commission on Banking Standards, the Banking Standards Review Council (BSRC), and widespread efforts by individual firms to strengthen internal controls. The introduction of malus, bonus clawback and the Senior Managers and Certification regime in the UK will strengthen accountability as well. This range of initiatives should make markets more fair and effective. But we need to make sure that taken together they add up to a comprehensive solution to fix the barrel and to get rid of the bad apples. A defining characteristic of our Review is a recognition that improving fairness and effectiveness is a shared responsibility between individuals, firms, the market as a whole and the public authorities. As I said at the outset, we believe that markets – when they work properly – are the best source of dynamism, prosperity and progress. So I expect that a key part of the Review’s final recommendations will consist of firm- and market-led initiatives. Where might the solutions lie? The framework we will be using divides up areas where the fairness and effectiveness of FICC markets may be deficient into six categories. Three of these relate to the structure of those markets: so-called market microstructure; competition and market discipline; and benchmarks. Three relate to conduct: standards of market practice; firm-level responsibilities, governance and incentives; and surveillance and penalties. The risk is that, as memories of recent enforcement cases fade, bad practices may re-emerge. Some say that may already be happening. We want to ask what more can be done to hardwire sounder approaches, including improved measures for appraising performance, promotion and advancement of individuals; better safeguards against inappropriate staff moves; ways to strengthen the role of boards in the governance of FICC activities; and ways to strengthen the role of front line managers, the so-called first line of defence. This is a moment when we need collective imagination – to imagine financial markets that are fair and effective and work in the interests of all of us.